My working studio space and gallery in Cave Creek is now open! This location lets you see works in progress, meet artists working on site and lets you see my art and beeswax paintings up close…come by and visit! Grabbed a quick coffee this morning to open up the new gallery space for the news team. 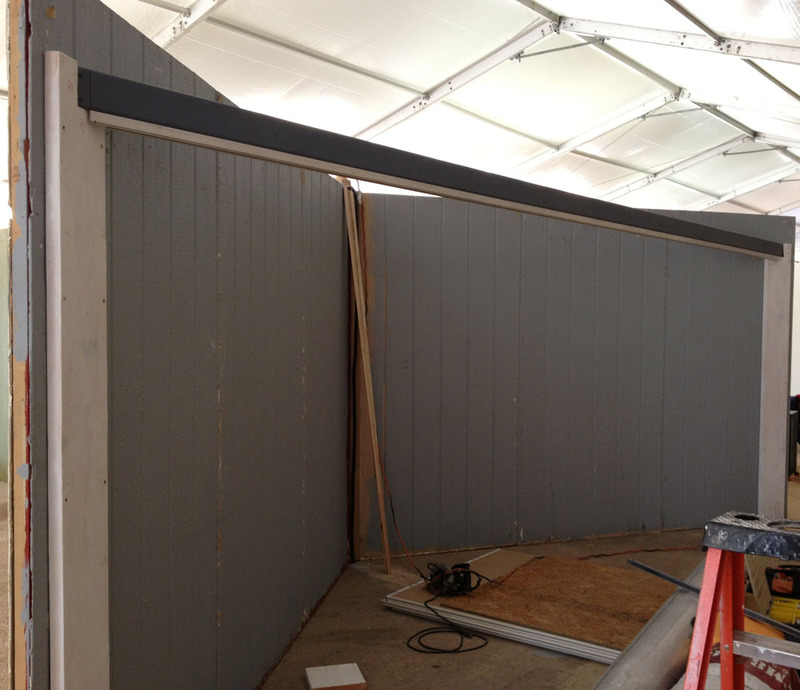 Gotta to love it when I say, "It's not officially open, let's do this another time…" and they say, they love previews! 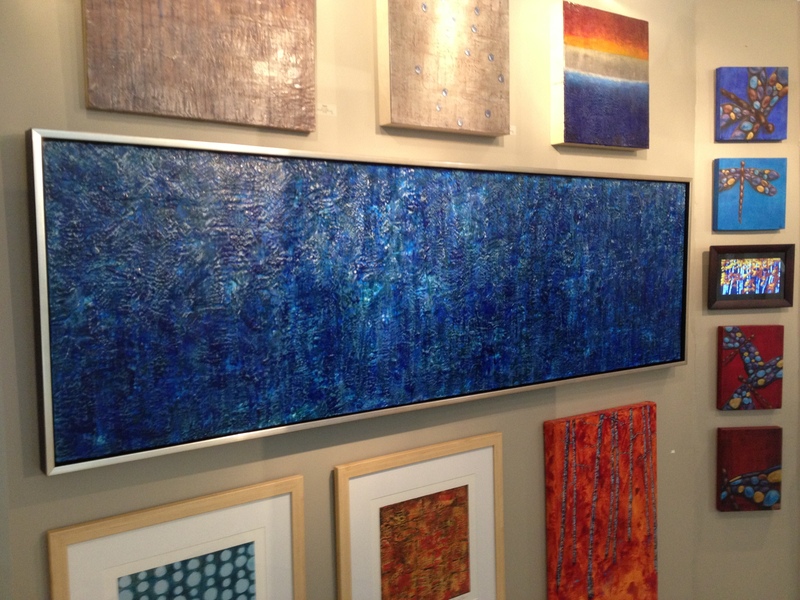 Water World, the large encaustic piece that I just finished and hung at the Celebration of Fine Art show is... sold! I am so grateful and thank God for it! I'll start working on the next piece of the same size (24 x 80) maybe it will be a vertical piece - don't know yet, but I'll keep you posted! Want one? If so, YOU get to pick the colors and if it's vertical or not - that would be fun! I finished this large encaustic, Water World, on Wednesday and hung it at Celebration of Fine Art on Thursday. It's 24"h x 80"w and framed in a floater frame - so much fun to do this size! 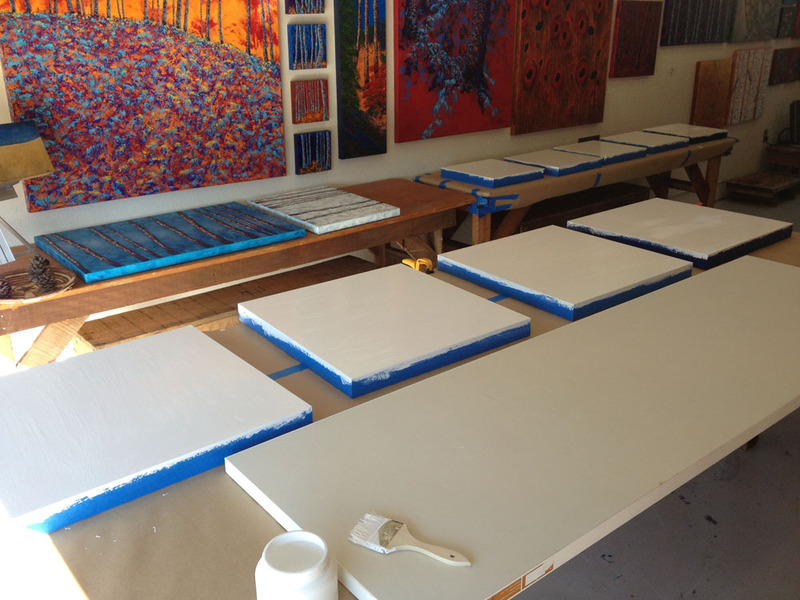 New encaustic works in progress... lined up on tables in the studio (other works on the walls are my acrylics). These each have several coats of encaustic gesso , then two layers of beeswax and resin, and now... I'm ready to paint! As each one is completed, I'll post it here and on my Facebook Page. Then they'll go on to my space at the Celebration of Fine Art. I'd love to hear your thoughts and comments on them! 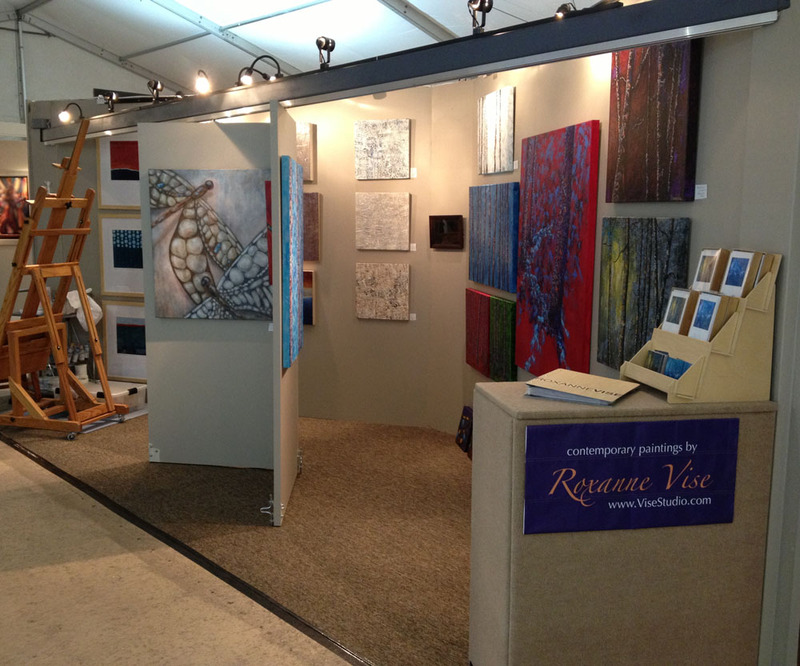 Here are photos of my space at Celebration of Fine Art - during set-up and after the sawdust cleared. The show goes from January 12th through March 24th, open every day. Be sure to check it out if you're in town (click link for directions) - there is an amazing concentration of wonderful artists! It's not often that you find deep water in the mountains... but, if that Deep Water is a painting... well, anything can happen! I began this hot wax water series mid-summer in Arizona - when I was dreaming of the California coast, scuba diving experiences, one of 17. 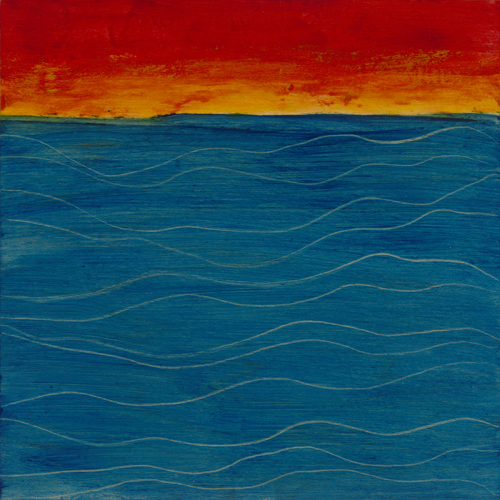 I've enjoyed becoming lost in this painting each time I began to thirst for that deep water feeling and was thrilled that Gussie connected to that same experience when she and her husband chose this painting for their home in Colorado. Dreams of Venice - or - Venetian Dragon, either way I name it, the colors of this painting remind me of the gilded art, architecture, fashion and language of all things Venice. Was a fun stretch for me, using gold and Golden's interference colors to create this dragonfly in simple composition. I made a new friend, Heidi. That's what collector's become. Friends. It arrived!!!! It is soooooo beautiful. It made my day. It's so vibrant and alive....I love it. Thank you. Thank you. It arrived in perfect condition. And the notecards are exquisite. Can't wait to share them. She went above and beyond to share her wisdom with me, a gift, and turned my attention toward Mary Oliver, a poet of poets. My wildly passionate, adventurous feasting art-spirit often needs a bit of grounding, a moment to focus. Started with a post of her poem...."My work is loving the world. Here the sunflowers, there the hummingbird... "
Then, well... got a reply from the publisher, Beacon Press, to my request to post it - they don't want Mary's poem posted in the world wide web. Bummer. So, I encourage you to go find her work elsewhere and devour it.